Who does not dream of fresh, all you can eat, reasonably priced sushi in Geneva? You were dreaming about it and Lola did it. Lola does not seem to be such a well known bar in Geneva. It is located in the Paquis neighborhood, right next door to the famous Mexican restaurant El Catrin. From Tuesday to Friday, from 6pm to 8pm, it is happy hour at Lola; all-you-can-eat sushi for 25CHF. It is a great deal compared with other sushi places in town and considering the high quality sushi, which is made on the spot especially for you. The portion size is also quite large. In addition to the all-you-can-eat sushi during happy hour, you can also order dim sum, gyoza (both at 9CHF for 4), ramen noodles (which start at 18CHF for the vegetarian ramen and 21CHF for the pork) and bao, the traditional Vietnamese bun filled with chicken, pork, beef or shrimp (6.90CHF per bao). The atmosphere is very cozy with comfortable couches and rattan chairs with blankets. The setting is stylish and beautiful. I had wine but the cocktails for 16CHF looked very enticing. I would recommend going for a romantic yet casual first date. 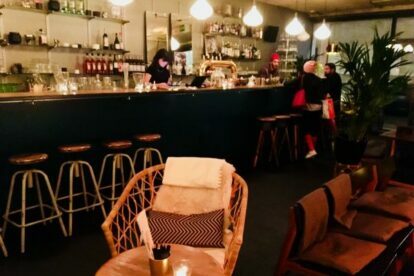 It does not seem to be the place to go party with a bunch of friends, but it is perfect for a laidback and relaxed evening. I was pleasantly surprised by this place and I surely recommend going.